With the rate of income tax fraud steadily rising, the IRS has been aggressively trying to plug the leak to one of the federal government’s largest sources of revenue. Individual income-tax accounts for more than 40 percent of the government’s federal tax revenue. So, it shouldn’t surprise anyone if the IRS decides to probe your tax return and investigate every penny you make. But not to worry, follow these quick tips and you’ll greatly reduce the chances of Uncle Sam knocking at your door with a calculator and magnifying glass. - Report ALL your income! We’ve all heard of celebrities who end up doing time in federal prison because they tried to hide their income and not give the government their cut. This is an extremely bad idea, and not worth the risk involved with owing the IRS money. NEVER do this and you won’t have to worry about having a cellmate named Bubba. 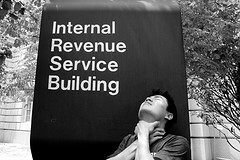 - Don’t claim ridiculous deductions! Your cat’s Christmas sweater is probably not going to fly as a business expense. The IRS will compare the deductions you claim to other people in your income bracket to determine whether you’re being reasonable or trying to get over on them. So don’t claim Fluffy’s clothing on your return. - Choose a professional and reputable tax/accounting firm to file your taxes with! If the IRS suspects that a tax preparer routinely fudges numbers, you could end up being one of the unlucky ones if they decide to audit all the clients of that tax office. Millions of Americans look forward to tax season for a much-needed boost to their finances. Your tax refund could give you the means to put a down payment on a new car, take much-needed vacation or pay down some debt. But if you still get audited, don’t fret. The Fortham Group tax preparers and accountants can help you sort out your issues.